Bending the walls of experimental electronic-ambient music, Dean De Benedictis creates a bold tapestry of sonic vibrancy on Salvaging The Present. Through the creative use of musical instruments and sound design tools, De Benedictis scores an emotionally deep, aesthetically appealing and technologically sophisticated triumph, blending organic and electronic expressions into a compelling panorama of music and sound. Vowel-based arpeggios and pulsing sequences modulate with abstract yet mesmerizing rhythms, clearly defining a distinctive sound that is deeply rooted in De Benedictis’ unorthodox technique of blending vocal samples with percussion hits. Added to that are many other elements – both electronic and acoustic – as De Benedictis rounds out the mix with his own performances on concert flute, grand piano, guitar, harmonica, hand percussion, cedar flutes, and voice, as well as contributions from Percy Jones (bass), Alexey Gorokholinskiy (clarinet), Peter Ludwig (cello, and voice), Lisa Claire Mitterer (vocals), D’Von Charley (native flute), Jim Goetsch (sax), and Angelo Elonte (violin). Rendering his sonic travels through realms of mystery, stillness and spirit, De Benedicits delivers fresh investigations into the environment of music and sound; an environment where electronic wizardry and acoustic dexterity combine with samples, effects and processing, resulting in a distinctive artistry that is truly unique. From the vibrant and energetic rhythms that propel the atmosphere onward, to the lush blankets of sound that wash over everything and give way to a delicate tranquility, the music of Salvaging The Present does indeed roll gracefully through the present moment, always evolving, and moving ever forward. - Steve Mecca, Chain D.L.K. What an interesting album this is. The first time I listened to it I wasn't quite sure what I was getting into but about halfway through I was hooked and each listen thereafter was a deeper journey into the heart of this fascinating album. What pulled me into this most excellently constructed soundscape was the first track on this album called To the Ends of Elation. I think that perhaps because it was so dense with things happening on the soundstage that a quick listen will not suffice for a listener to truly appreciate all the work that Dean has put in on this recording. With this first track clocking in at 8:29 it really gives you a chance to dig into the composition and feast upon the carefully constructed composition that is aurally satisfying as Dean shifts and weaves the sounds onto his musical canvas in very pleasing and very thought provoking ways. And lest you think that this album was going to be a one track wonder never fear because track 2 called Micro Souls Anthem also clocking in at a hefty 8:18 simply picks up the ball from the first song and continues to dazzle the listener with even more sonic mastery as Dean continues to move this album forward into deeper realms where the ground suddenly gives way from under your feet leaving you suspended in the darkness surrounded by a velvety blackness which is the start of track three called Pagoda Tiempo. This song has a quite the range and since it has a length of 9:36 it has the luxury of building momentum as it moves along. From the darkness there comes the occasional sounds and those sounds begin to become more dominate until around the 3:30 mark in the song they gradually build up and almost take on a darker overtone as they begin to shape and contour the musical landscape into something else. By the end of the track you are given a brief respite as you are allowed to float into the next track. Never the Sacred Stretch which is the next song on this album is a standout song and features some very imaginative work as Dean blends and tweaks and constructs sounds and sequences into a masterpiece that simply grabs and holds the listener's attention throughout this excellent piece. By the time I had reached this song I already knew that I would be going back for a second and a third listen so that I could comprehend all that Dean was pouring into each and every song on this album. This song would be a great standalone composition that could be listened to over and over again. All in all this album is a wonderful effort from Dean De Benedictis that spotlights his ability to shift the sonic landscape of his music into a variety of shapes and configurations until it becomes what he needs it to be to complete his musical vision of the finished product. It is a well balanced album and keeps the listener interested and moving forward at the behest of the musical current that Dean has created during the flow of this project. Just because music is not a physical thing that can exhibit currents like a river don't let that fool you into thinking that music doesn't have a current that can pull a listener along as it carries you downstream. It can. It does. Salvaging the Present does indeed have a current and as you listen you will find that it is quite a strong one that it will pull you along to the very end of the album. Highly recommended by Ambient Visions. Describing Dean De Benedictis as an ambient-electronic artist doesn't quite cut it. As the nine productions on his Salvaging The Present show, it makes more sense to think of him as an electro-acoustic sound painter, someone who works with tone colour and arrangement much as an abstract visual artist might when confronted with a blank canvas. To be more precise, a typical work by the Southern California-based De Benedictis is less emblematic of the Colour Field style, given its emphasis on swaths of flat, uniform colour, than one where multiple hues appear in micro-detailed configurations. Put simply, Salvaging The Present favours intricate, multi-layered tapestries over monochromatic displays. The amount of detail in a De Benedictis production can be staggering. In the opening minutes of “To the Ends of Elation,” for example, processed flutterings of acoustic guitar emerge alongside snippets of vocal choirs, piano, and synthetic treatments; a crisp electronic pulse and neon-lit synthesizer flourishes eventually emerge to bolster the music's lulling flow, and the listener's attention never wanders when the music engages the senses with a non-stop parade of stimulation. On “Micro Souls Anthem,” De Benedictis's artful hand is demonstrated in the way he organizes a plenitude of vocal, percussion, and synthetic elements into a dizzying swirl without sacrificing coherence in the process. Always in motion, the tracks undergo constant metamorphosis as they make their way through journeys of six- to nine-minute durations. Though he's certainly capable of engaging the listener by himself (he's credited with concert flute, grand piano, guitar, harmonica, hand percussion, cedar flutes, and minor vocals), De Benedictis brings a number of guests on board to add to the display. It's great to see bassist Percy Jones (Brand X, Stone Tiger) participating, and individual tracks are elevated by the contributions of others. “Never the Sacred Stretch,” “The Purity of Season 279E,” and “Whisper County” are enhanced by the lyrical string flourishes of Angelo Elonte (violin) and Peter Ludwig (cello), while Jim Goetsch (sax), D'Von Charley (native flute), and Lisa Claire Mitterer (vocals) also make their presence felt. For the most part, Salvaging The Present teems with energy, its seventy minutes vibrant and alive. Yet De Benedictis sometimes balances the restlessly mutating tracks with an occasional ambient episode—even if the moment doesn't last long. While “Pagoda Tiempo,” for instance, is marked by serenity during its opening minutes, it gradually swells in ominous portent when wailing synthesizers and bowed strings darken the skies. He's no doubt been influenced by others—that bubbling sequencer pattern pulsating through the undergrowth of “Night Arch” is vintage Tangerine Dream, and the track even hints at a dub influence—but the action-packed panoramas on Salvaging The Present show him invigorating the ambient genre with enthusiasm, imagination, and conviction. Eleven years after releasing Salvaging the Past on Spotted Peccary Records, Dean De Benedictis (a.k.a Surface 10) returned to the label to release Salvaging the Present, a spiritual successor and “sequel of sorts” (in De Benedictis’ words) to the record in October. Salvaging the Present is full of De Benetictis’s trademark sounds: woodwinds, minimal percussion, and piano. He manages the meeting of acoustic and electronic with a deft touch, building tapestries that are minimal, sophisticated, vivid, and emotional. Taking sounds from seemingly disparate sources, it seems that salvage is a good metaphor for the record. It’s almost like Salvaging the Present is a journal of De Benedictis’s travels, a collection of discarded sounds and ideas brought together to paint outlines of emotional states, leaving silences that encourage conscious listener participation, eventually filling with vocal samples, strings, or the idiosyncratic beeps and whirs of IDM. But Salvaging the Present is just as vibrant when taken with a meditative absence—it tickles something in the brain that encourages creative thinking. I think it’s something about the spaces between the sounds that triggers the creative mind. That isn’t to say that much of Salvaging the Present is silence; there’s very little silence in the record. It’s that, in keeping with the “ambient” label, the wide spectra of sound that flow through the tracks fall away, becoming their own kind of silence that elevates the carefully chosen leading instruments in each piece. The hour-long, 9-track album fluctuates energetically, moving from ultra-minimalist stretches to active constructions. Of the tunes, my favorite is the opener, “To the Ends of Elation.” It’s clever use of spliced recordings of guitars and pianos played forward and backwards, combined with the ethereal vocal melodies, creates a beautiful tune that has more of a hook than ambient tracks tend to have, without having it become cumbersome. It’s like the head melody in a piece of jazz—he returns to it to reset the piece before jumping off on another musical tangent. The result is a sophisticated piece of music that shifts between states—from ambient guitar to IDM-accompanied piano and back—seamlessly, even if the different periods within the piece feel so different from each other. Salvaging the Present is a beautiful record, perfect for the surprisingly rainy winter we’re facing in the San Francisco Bay Area. But it’s equally at home when the sun finally peeks out from behind the clouds. 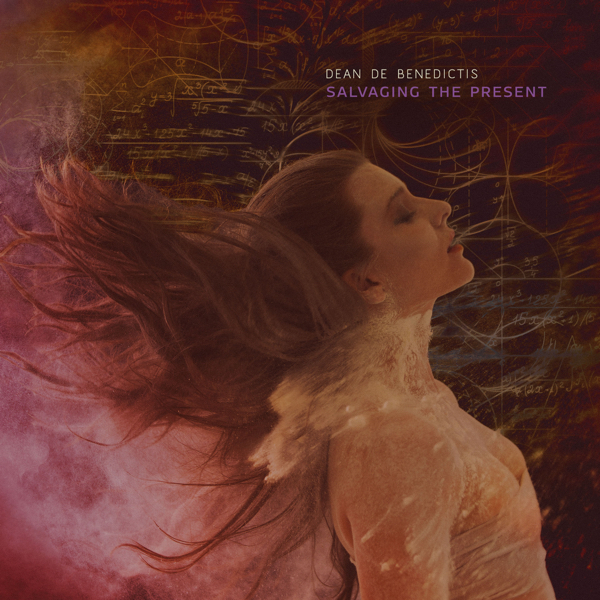 Veteran composer De Benedictis has been around for some time, and “Salvaging The Present” is a unique melding of elements from various musical streams, gelled into an immersive and uniquely inventive and personal mix that would easily function as a soundtrack to a playful surrealist film. Opening with the curious “To The Ends Of Elation”, which joins elements of prog-rock with immersive ambiance, De Benedictis brings together unusual and often disparate elements into his hallucinogenic sound stew. “Micro Souls Anthem” has a similarly upbeat and lively vibe with nicely deep mixing. “Pagoda Tiempo” uses a sampled and effected slice of dramatic orchestral strings before drifting into a more celestial ambience. Just beautiful and so very effective. “Never The Sacred Stretch” could easily function as an electronic soundtrack to a surreal interpretation of “Alice In Wonderland”. “The Purity Of Season 279E” brings to mind a rolling Western desert landscape, somehow, whereas “Whisper County” is a gentle reverberation from times past, as remembered from a wooden porch and a rocking chair. “Regret In G (The Sky Remembers)” closes it out with a drifty, almost shoegazey haze. De Benedictis isn’t afraid to cross genre boundaries, and calling this an “ambient” album is a disservice. Aspects are there, but “Salvaging The Present” is a modern electronic music journey that doesn’t have limits or boundaries. It’s a journey that I’ll want to make again. Dean De Benedictis has a bed, but does not sleep. He is a man made out of electricity, with creativity siting in his chest like a burning sphere. Forever battling convention, the current of his energetic imagination is released throughout Salvaging the Present (70’09”) – an album wandering in wonder across nine stormy stories in electronic sound. Knowing that people both crave the new, and fear it, De Benedictis works out an appealingly ingenious mix of mammoth forces, minor exaggerations, and modish pranks – all in service to an ample cosmological orientation and awareness. De Benedictis is a technologist, still moving faster than the wave. The mental machinery he used to realize Salvaging the Present effectively imagines glowing sonics and grooves, as well as it does dreamy thought zone tones. From out of the middle distance, sounds, wider than they are high, emerge and ascend. At the margins of perception, a pixie-dust lightness, then the immense sigh of gracefully deformed metal. In a moment of somnolence, we envision night-blue sky – in the layering diaphanous tones of breathing strings and ethereal choir. Restorative sunlit notes offer balance, when velvety dungeon hues of dread become too much to bear. Why can not men better appreciate the present? The invisible now… We find with Salvaging the Present an openness to each and every moment as an opportunity to create something new – and the hope to have renewed, our faith in the potential we carry within. While this is ambient music, and perhaps somewhat electronic based, it’s far more than one guy hiding behind an assumed name layering gobs and gobs of synth overlays on a recording. Dean de Benedictis has a long list of recordings to his credit, and like a few others, understands the artistic value of blending acoustic instrumentation with electronic and sampled sounds, adding entirely new dimensions to the compositional structures and emotional depth to the arrangements. The nine pieces here mostly fall into the six to eight minute range, and encompass a wide range of organic sounds that seem to be morphing and stirring constantly. De Benedictis for his part plays concert flute, cedar flutes, piano, guitar, hand percussion, harmonica, and some vocals. I don’t see a synthesizer in that list, do you? The electronic sounds we hear are more the results of studio processing of acoustically produced sounds. Joining him are Percy Jones on bass, clarinetist Alexey Gorokholinsky, Peter Ludwig on cello and voice, vocalist Lisa Clare, D’von Charley on cedar flute, buffalo drum, and voice, Jim Goetsch on sax, and Engelo Elonte on violin. From some of the sounds heard throughout this journey, a listener might suspect the involvement of some synthesizers, but that is certainly not the case, instead created via acoustic instruments and densely layered soundwalls of processing. The overall result is both mysterious and enchanting, sometimes intensely rhythmic, at other times atmosphric and delicate, evoking deep space drifts and evolutions of cosmic proportions, as it moves forward and never looks back. Fans of Forrest Fang’s recent work might do well to check this one out.